Updated: April 14, 2019, 2:54 p.m.
A friendly neighborhood snow cone truck is trying to make Tax Day a little less horrible this year. Kona Ice will be parked at 300 Henry Ward Way near the Gainesville square from noon to 3 p.m. on Monday, April 15, which if you’re not aware is the deadline to file your taxes. Surprise! Gainesville franchisees Morgan and Paul Kleiber will be giving out free snow cones on Monday as part of the brand’s national Chill Out Day on Tax Day. All Kona Ice franchises donate 20 cents of every dollar earned, according to Morgan Kleiber, and in the local companies four years in business it has donated about $120,000 to various causes. 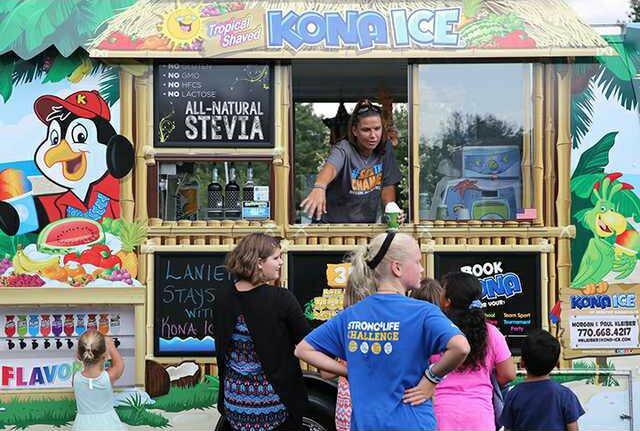 Local Kona Ice gigs usually end with a donation of 20 percent of the company’s revenue, whether its cutting a check to a nonprofit or local school or just trying to take a bit of the sting out of Tax Day with some free snow cones. Kona Ice has four full-time employees, including Morgan and Paul Kleiber.